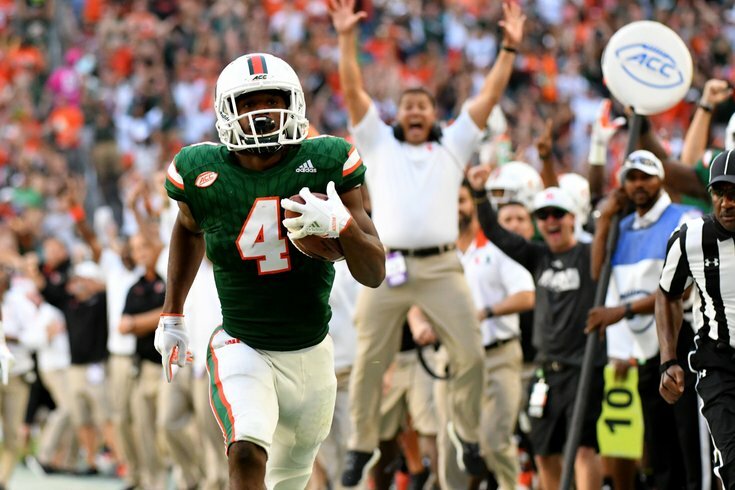 The guy in the background is excited about Miami S Jaquan Johnson's fit with the Eagles. The college football season is in full swing, as we are now into the sixth week of a full slate of games. Ross Pierschbacher, OG/C, Alabama (6'4, 303): (1) Alabama at Arkansas, 12:00 p.m.
Pierschbacher has been a starter on Bama's offensive line since he was a freshman in 2015. By the time his college career is over, he's going to have close to 60 starts under his belt. In his first three seasons, Pierschbacher got experience starting at both guard spots, before taking over at center this season. The Eagles will value that versatility. Eagles starting LG Stefen Wisniewski was one of the pleasant surprises of the 2017 season, but he is reportedly in danger of losing his starting job, per Dave Zangaro of NBC Philly. If the Eagles cut or traded Wisniewski next offseason, they would save $3 million, with $708,334 in dead money. He is a candidate to be a 2019 cap casualty, and a player like Pierschbacher could be a long-term answer in his role. Jaquan Johnson, S, Miami (5'11, 190): Florida State at (17) Miami, 3:30 p.m.
At 5'11, 190, Johnson is undersized, which doesn't seem to bother Jim Schwartz much at all, given that the team signed Rodney McLeod (5'11, 183) and are now looking at Avonte Maddox (5'9, 184) at safety. Johnson would be a great fit in the Eagles' defense. Joe Jackson, DE, Miami (6'5, 258): Florida State at (17) Miami, 3:30 p.m. The Eagles have an obvious need at defensive end, with Michael Bennett and Chris Long nearing the end of their careers, and Brandon Graham becoming a free agent next offseason. Benny Snell, RB, Kentucky (5'11, 223): (13) Kentucky at Texas A&M, 7:00 p.m.
On the downside, Snell doesn't have much in the way of receiving production. We'll see what happens with the Eagles' reported interest in Le'Veon Bell, but as this season has shown, you often need a deep stable of running backs in the NFL, and Snell could make sense in the middle rounds. Montez Sweat, DE, Mississippi State (6'6, 245): (8) Auburn at Mississippi State, 7:30 p.m.
Another defensive end with good production is Sweat, who managed 10.5 sacks last season, despite being shut out in the sack column first four games. In 2018, he already has 4.5 sacks. Sweat originally enrolled at Michigan State, left to play at a junior college, and then landed at Mississippi State. The concern here would be that Sweat has skinny legs, so there will be questions about his ability to hold up against the run in the pros. Do you bulk him up a bit to play 4-3 DE, or is he a 3-4 OLB? That would be a question the Eagles will have to figure out, but he clearly has very good pass rushing traits.